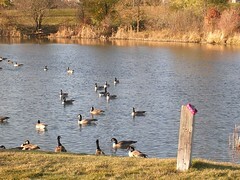 Today was so mild that the ducks were back! 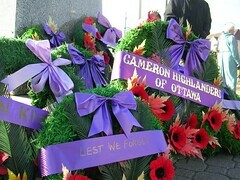 And I had my camera so I got these pix. Not great wild life shots, I will admit. But they are representative and I got to stand there and watch the ducks doing whatever it is that they were doing. 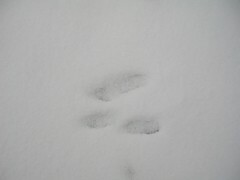 Then as I was approaching home and still had my camera out, I saw these perfect little footprints in the snow. I am always surprised by how big squirrels' feet are. And you can see the tiny toenail imprints and everything. It is minus 14 C out there this morning and I don't think I'll see what I saw yesterday along the bike path, as I was out without my camera. I was walking along and I heard this noise. 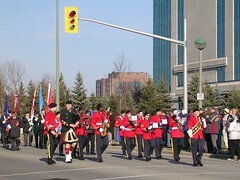 It was a repetitive noise, not very loud and kind of low. Low in pitch and low in where it was coming from. It wasn't mechanical, although it repeated very quickly - sh-sh-sh-sh. 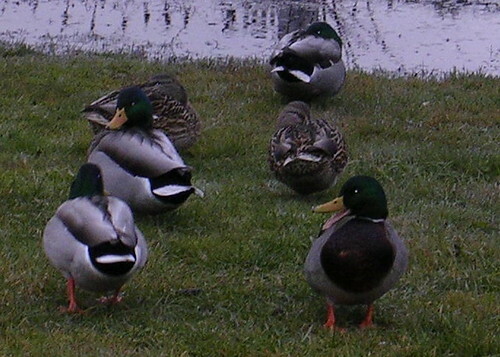 I started scanning around to see what might be causing it and that's when I spotted the married pair of Mallards by the side of the path. 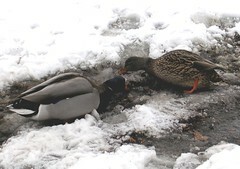 They were standing in (for them) ankle deep water and they had their necks stretched out with their beaks as parallel to the ground as they could get them. And they were eating the grass under the bit of water. 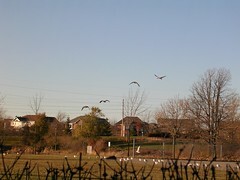 They'd grab the grass and squish it through their beaks and do this so rapidly that it made that noise I heard. They were so absorbed in what they were doing that they didn't even look up at me as I stopped and stood not two feet from them to watch them. And they were still there three hours later when I walked back the other way. We rented a car for the weekend and so we drove everywhere from Friday to this morning and that really puts a crimp in walking leisurely around the 'hood, I must say. After the snows of last week, it is mild today and we are finally getting the patio furniture into the garage for the winter. I suppose it should have been done before now but I think we were hoping for one more day, warm enough to sit out, even if we had to wear coats. Now, we can always get out the folding lawn chairs, I suppose. Today, I mostly took pix of the bike and foot paths. 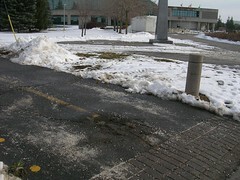 For years, I have bemoaned the fact that some of these paths are not plowed during the winter, even when there is plenty of evidence that people use them. When especially snippy, I would gripe that you just don't rate unless you have four wheels and an engine. 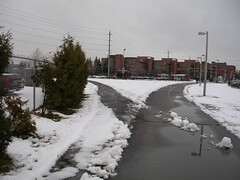 This morning, as I went over to the college early, I took this photo of the bike path as it bends behind the transit station. 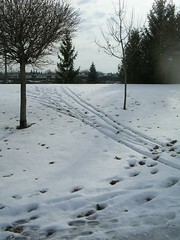 Sure enough, there were plenty of footprints but it hadn't been plowed. 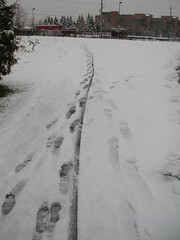 Imagine my pleasant surprise to discover, later in the day, that the path had been plowed! 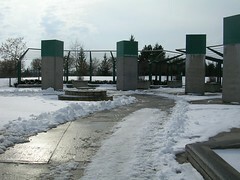 This picture was taken looking north, The transit station is on my right and this is the path that goes behind it. I didn't explore to see how far north they had plowed but it looked like it continued on under Baseline at least. They didn't plow the part that curves to link up with the main east-west path, that part I took a photo of this morning, but you could go straight and then make a hard right turn if you were on a bike. 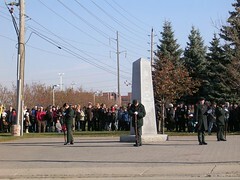 I decided to walk into Centrepointe Park on my way home, to see what was happening there since I hadn't been out on the weekend. 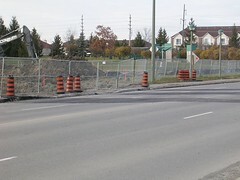 I noticed as I got to Centrepointe Drive itself that the centre bollards keeping vehicular traffic off the bike paths had been removed to allow the plows in. 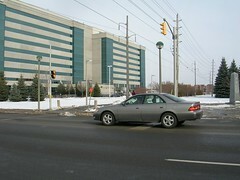 I pushed the signal to stop traffic so I could cross the street and as usual, cars went through on the red light. I guess they think that you can't get out on the road that fast and they have time to sneak through as the light turns red. This woman came barreling in pretty fast and then did stop, but only after she was halfway across the "stop line". I had my camera out to take the previous photo of the missing bollard so I turned around and snapped one of her. I have a theory that it's the speed that makes people even more impatient and warps their judgment. 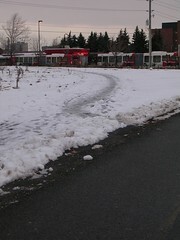 As I headed toward the park I was surprised to see evidence of plowing. In my more than ten years here, I don't think I have ever seen the park paths plowed, even though a lot of people walk out of the subdivisions behind the park to access the bike path to get to the transit station. 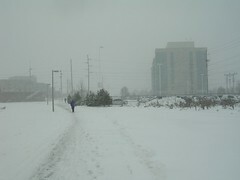 I noticed that some folks had been ready with their cross country skis and had been out enjoying the fresh snow. 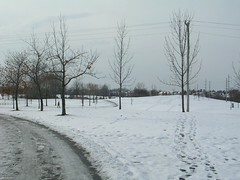 And then I saw that the whole of the internal pedestrian path around the park has been plowed! Not very well in spots and there was ice to stumble over, but it's a start. I am happy to see this because I think it encourages people to get out and walk even in the winter and that's a good thing for everybody. At this point, the person driving the plow got off the path and caught a huge chunk of sod and curled it up like a wave. 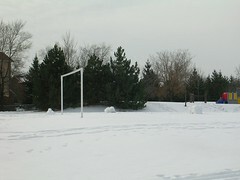 Finally, I noticed that someone had been out rolling snow to make a snowman. Given the right conditions next time (the snow has to be the right kind of sticky, for those of you reading who don't live above the 40th parallel), I think I may have to go do that too. It has been years since I made a snowman. November 22, 2007 "First snow"
Yesterday was the first day we had snow this season, but I didn't get the photos up until today. And then there was more snow. Yesterday was slightly warmer and we had less snow than today. 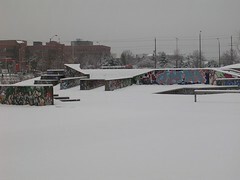 The skateboard park was quiet and empty. The slopes aren't long enough the attract people with sleds. When I walked by the split in the bike path in the morning, nothing had been shovelled and there was evidence that at least one person had braved the conditions on his bicycle. 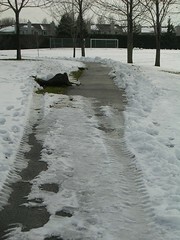 Later in the day however, both sections of the path had been plowed. This seems unusual to me because I don't remember ever having seen the branch of the path that heads toward the river cleared of snow in the past. I wonder if there was a new snow clearing person and they just wandered off down the path without knowing it wasn't part of their job? 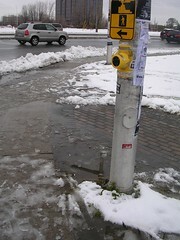 Later, when I got to the corner of Woodroffe and Navaho, I saw the usual mess that has prompted me to buy waterproof boots. There are street plows and sidewalk plows and they don't seem to coordinate with each other, so snow piles up on the corners, right where pedestrians need to cross the street. 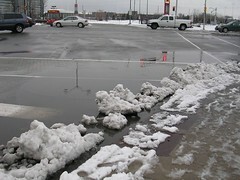 Then when it is mild, a giant deep puddle forms because the snow is blocking the drains. In addition, as I pointed out earlier, the poles that have the buttons on them to push so you get the "walk" signal, are surrounded by dirt which turns into mud and here is evidence of that. 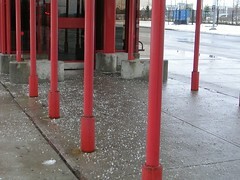 Even though it was mild, the maintenance folks at OC Transpo had been out distributing more salt than you can imagine. I know they don't want to have people fall but this is ridiculous. And couldn't they use sand, as it is far less corrosive than the salt? When I had a dog, I couldn't walk the poor thing anywhere near the bus stop because the salt would hurt the pads of its feet. 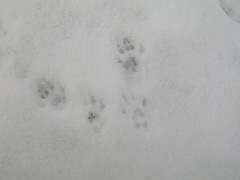 When I left the house this morning, I saw bunny tracks on the driveway in the fresh snow. This is common all winter long but I always find it a pleasant sight. Still, I worry about where these bunnies spend their winter. 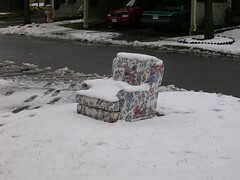 I walked by that abandoned chair, making a mental note to remember later when it disappears (finally). Then I passed this flurry of footprints in the parking lot. 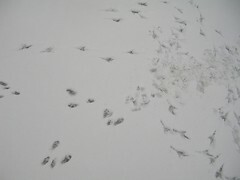 It seems to be a combination of pigeon and rabbit tracks and they organize around some sort of food that left crumbs. It was good and windy and still snowing when I walked home, and I wondered if the conditions met the criteria for a blizzard. They didn't. I looked "blizzard" up first at dictionary dot com and it said a blizzard has to have sustained winds of at least 56 kph and visibility has to be reduced to less than 400 metres. The Wikipedia article (at the link above) says the winds have to be 40 kph, visibility has to be less than a kilometre and this has to last for at least 4 hours. In any event, I don't think this will rate as a blizzard. Today was a bird day. 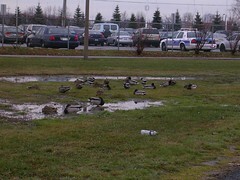 When I rounded the corner of the utility building beside the skateboard park, there were all these ducks, sitting or standing near the puddles that had formed overnight from the rain. Many had their heads tucked under their wings. But when you got a little closer, you could see that they still had one eye open. 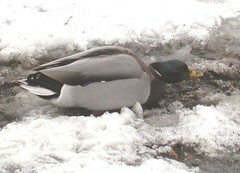 The drake on the right with his beak open was quacking but not very loudly. It looks more animated than it was. They were pretty calm, these ducks, even if it was midmorning and people were walking by. 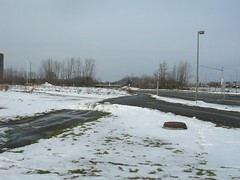 This is the long view, which shows them all in context, with the bike path, parking and garbage near by. A busy spot but when you need a nap, you just have to take one. 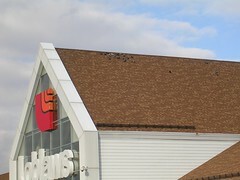 When I got over to the Loblaws, I noticed a flock of pigeons had decided to catch a few rays up near the peak of the roof. 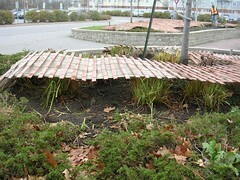 I wonder how comfortable it is, hanging onto roofing tiles with one's toenails? Maybe if you only weigh a few bird ounces, it isn't such a big deal. Back on November 5, I noted a pile of cardboard over at Plunkett and wondered how long it would be there. It did stay for several days, but then one day, it was gone. 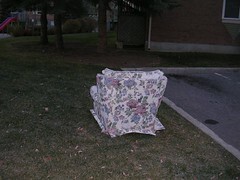 Now, in the same location, it has been replaced with an upholstered chair. The chair actually looked pretty good and its four wooden feet were sitting on the seat cushion. After last night's rain however, I am not sure what condition it wil be in. Yesterday, I thought I would follow up another earlier post by showing the paving that has been completed on Centrepointe. I didn't examine it up close so time will tell how bad it might get over the winter. 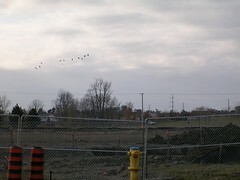 I thought I'd take another shot of the construction site itself. They hauled away one of the big high hoes but there is still one working in the site. 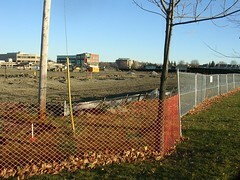 But there are many survey marks now and the crushed stone has been deployed so I think it is time for the foundations. 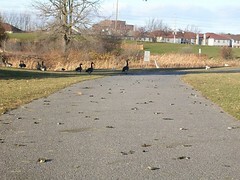 As I was taking the photo, I noticed a small flock of geese coming in for a landing, and as I zoomed in on them, I saw the small garbage pick-up truck, trundling around the park. The garbage does get picked up nicely in the park but you rarely see them at work, doing it. 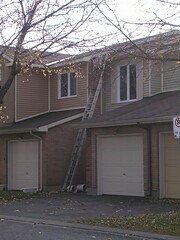 When I got home, I saw someone had been hired to not only clean out the gutters but fix them as well. Good work! 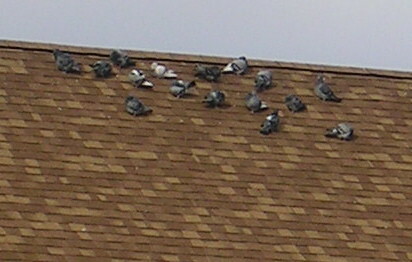 Finally, this morning, I looked out the back window and noticed something white at the exit of a downspout. 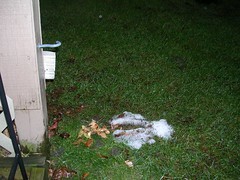 When I went to look, I saw that it was snow! There wasn't snow anywhere else and it is above zero, but there it was, nevertheless. I am guessing that precipitation overnight congealed at the base of the downspout. But usually, it would come in the form of ice, not snow, so it is still a bit of a mystery. I forgot I took these pix on Thursday. 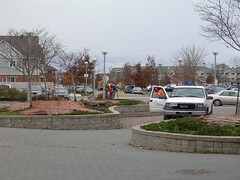 They are preparing the gardens at the old city hall for winter. I think those are irises beneath the snow fencing. They have some lovely very dark purple irises that I enjoy every time I walk by in the early summer. 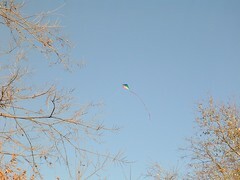 We took a turn around the park this afternoon and it was a real pleasure to walk into the park and see a bright kite flying. It was a windy day and pretty cold - about 3C. 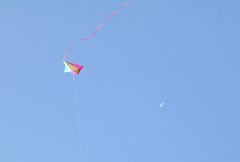 The kite was initially tethered to the children's play structure at the edge of the park but later, we watched the kite flyer walking across the park with kite in tow. It always looks better the real life but I snapped this photo anyway, when an airplane crossed the sky right where the kite was. 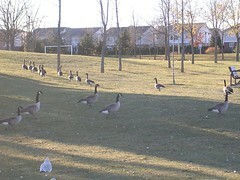 The geese were out in force today. You'd think they'd be seriously packing their bags to head south. pooping everywhere - look at those poop logs! and walking in several different directions at once. One group finds something interesting over the hill and another group heads for the pond. All with deliberation. We noticed that a section of the metal chain link fence was missing over at the construction site and some orange plastic fencing has been put in its place. You always wonder if someone stole the fence or what happened to it. Just a few pix from other days. I haven't had the opportunity to use them yet and so saved them for days like today when I had nothing. 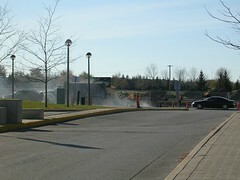 Two days ago, they paved the road in front of the construction site. I guess they have finished hooking up the sewer and water lines and whatever else runs under to road and now they are paving the hole. 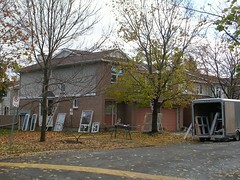 For a couple of years now, the condo corporation has been gradually replacing all the windows in all the units. It's a good maintenance thing and the units are more than 20 years old (I think they are closer to 25) so it's money well spent. We got our windows last year and I have noticed a difference in drafts. 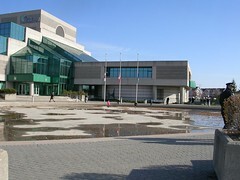 Over at the old Nepean city hall, they have drained the reflecting pond in preparation for turning it into a skating rink. They even have a real Zamboni to clean the ice! Last night was the Annual General Meeting for the condo corporation. I had decided that it was time I volunteered to serve on the board, on the basis that being on the board is one of the obligations of ownership and so I put my name on the list for the election that night. At the meeting, I got up and said why I was running for the board and in addition to the "obligations of ownership" line (scintillating I am sure!) I also said that I liked the community that was our condominium association and how I thought I could contribute to it if I was elected. As it turned out, I was elected and so I'd like to thank all those people who voted for me and who said even before the meeting that they'd like to have me on the board. I hope that for the next two years I will be able to maintain the good works done by previous directors and that maybe I will be able to think of ways to save our association money here and there and make things even a little bit better. I have been musing about an article I saw in the Citizen of November 3, 2007, where it was reported that condo owners were looking to reduce property taxes because they were already paying for things like snow removal through their condo fees. I'll see if the board has already been looking into this at our first meeting next week, before I go off and reinvent the wheel. 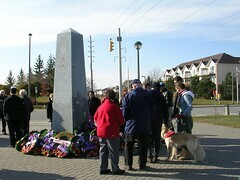 Suggestions were also heard about having a sort of Welcome Wagon for new members and improving communications. The new condo website was unveiled, which I think is an excellent means of getting information out to many members of the association. Of course, there are some folks who do not have computers and who do not access the internet so we still have to think of them. 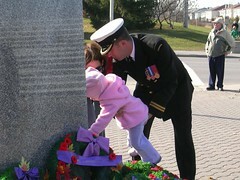 And being welcomed to a new neighbourhood should really come in the form of a personal touch. But this is said with the mindfulness that all work done by not just the board members but everyone else in the community is voluntary and so people should only be doing what they have the means, especially in time, to do. Another topic of interest at the meeting was the hedge that divides our property from the new construction site next door. 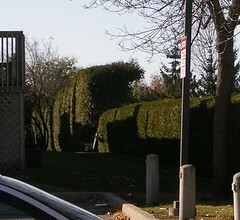 This hedge is as old as the subdivision which is to say, about 25 years old. It has grown very tall and apparently, it was supposed to be trimmed fiercely over the last few years to bring it down to a manageable size. On my way home today, I noticed for the first time what a state it was in and took this picture. The shorter hedge belongs to the community at Plunkett Court and ours is the raggedy hedge looming beyond it. 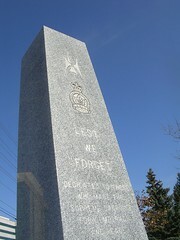 I have a feeling that some time in the not-too-distant future, the whole thing may need to be ripped out and replanted. Nothing lasts forever, especially not living things and all that construction right beside this part of the hedge may not be doing it any favours also. It will be a wrench for the people whose property backs on to the hedge, to lose that privacy for a while. But my own property backs on to a chain link fence and we can see right in to the yards of the people who live opposite and yet we manage.